One of the most common arguments used against those who deem multi-level marketing companies pyramid schemes, is that pyramid schemes collapse. Because Herbalife hasn’t collapsed, it must not be a pyramid scheme. Because the company has avoided total collapse for more than 30 years, it can’t possibly be a pyramid scheme. That is false, and I will demonstrate the falsity with the help of Bill Ackman. A pyramid scheme has been defined as a scheme in which the participants obtain their monetary benefits primarily from recruitment rather than the sale of goods and services to consumers. What you see is that the only people making substantial money are a few people at the top of the recruiting pyramid. Only 0.14% of the sales force makes more than $20,000 per year in gross earnings (before subtracting any business expenses). Yes, that’s less than one percent! And a full 93% of the sales force makes no commissions. 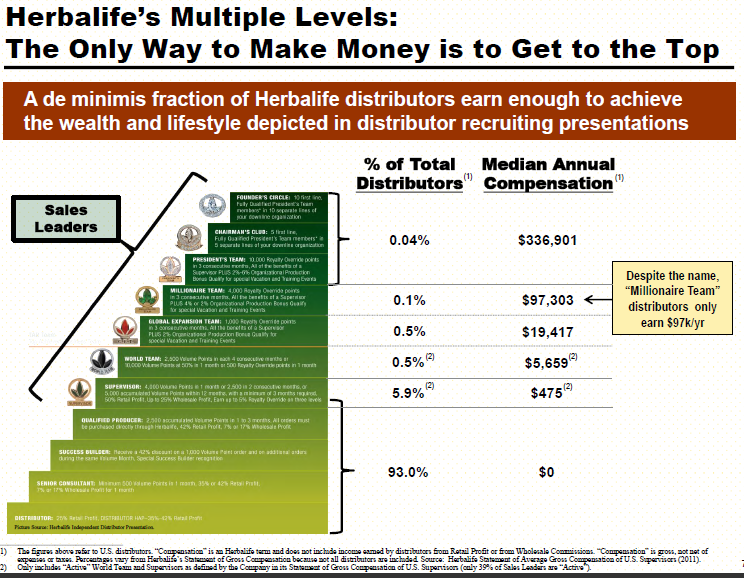 The next graphic shows how a distributor can only get to the upper levels of Herbalife by recruiting. (Again, click the graphic to see it full size.) To get there, a distributor must recruit people who also recruit people. No amount of “retail sales” by the distributor will get him or her to the top, because to get there you must have “royalty override points” which can only be accumulated with a downline. But what about retailing? Multi-level marketing supporters are fond of saying that a living can be earned simply by selling the products. So if you don’t want to recruit, don’t recruit. Just sell lots of products! Ackman debunks this argument in a couple of ways. First, he shows at right (click to enlarge) that the Herbalife products are overpriced. 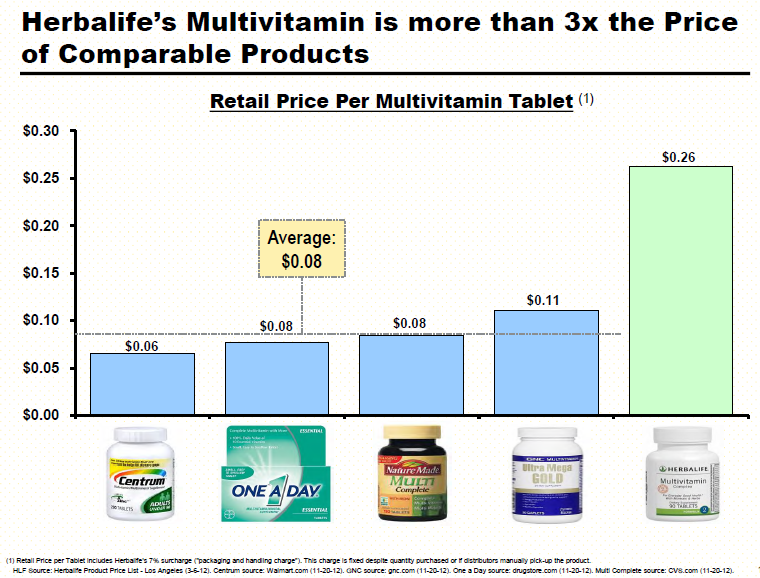 Herbalife’s retail pricing of its multi-vitamin is more than three times the price of comparable brand name products on the market. Supporters might highlight wholesale pricing, which they claim is the reason many distributors sign up. They simply want a discount on their products. Entry level distributors get a 25% discount off retail pricing. Even at this wholesale pricing, the cost of Herbalife’s multi-vitamin is more than twice the cost of comparable products. 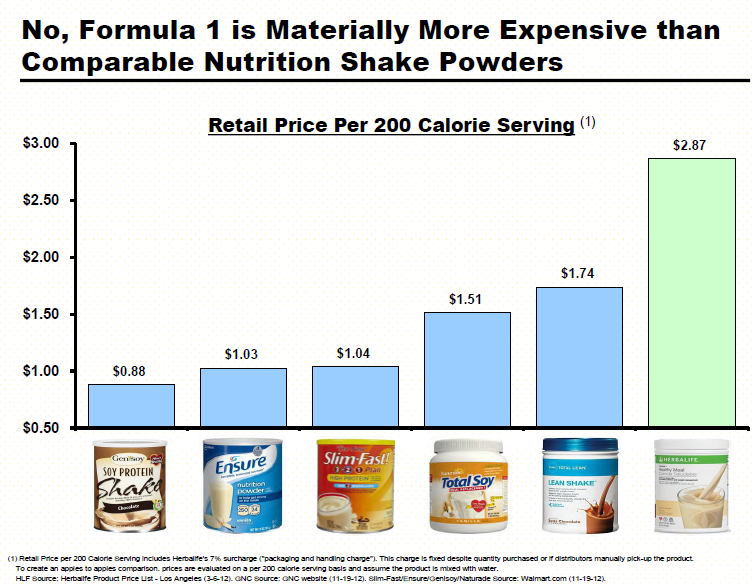 Herbalife’s most popular product, the Formula 1 nutrition shake is more than twice the price for a 200 calorie serving than the average price of five well-known brands of nutrition shakes. Still, distributors can profit by selling products at retail pricing, can’t they? Not in the real world. Ackman looked at Herbalife distributor websites as well as several years of eBay sales data. The research found that Herbalife products are widely available at around 35% lower than suggested retail pricing. If you’re a distributor who doesn’t want to recruit and only wants to sell products, you will get a 25% discount off suggested retail price. Then you’ll pay 7% of retail pricing for shipping and handling charges. That means you’re essentially getting an 18% discount off retail pricing. 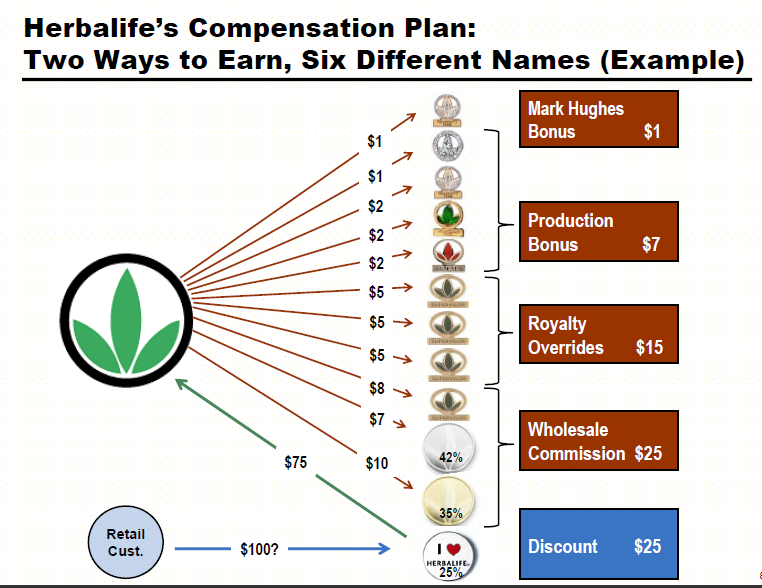 Consumers can easily buy Herbalife products from other distributors for 35% off retail pricing (less than you, the distributor, pay for your products), so you will essentially be unable to develop a profitable business retailing HLF products (unless you’re able to find a bunch of lazy or stupid customers who will overpay for their vitamins and shakes). The upline, however, can earn up to $48 on that same sale. 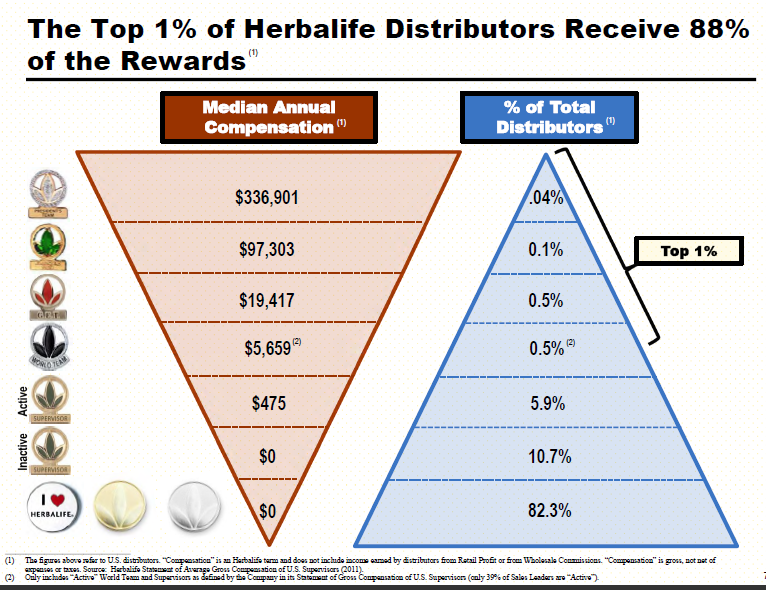 Total compensation maxes out at 73% of full retail pricing, per Herbalife’s disclosures. Yet the person doing the actual selling only gets $25, while the upline collectively can get almost double that amount. Yet another way that multi-level marketing supporters try to convince people that they’re not pyramid schemes is by focusing on the internal consumption. This refers to product consumption by the distributors themselves. If we pretend that the distributors are consuming or selling the Herbalife products they purchase, then we in fact have retail sales and the company is not a recruiting scheme! One sign of a pyramid scheme is if distributors sell more product to other distributors than to the public — or if they make more money from recruiting than they do from selling. And the fact is that MLMs like Herbalife have purchase requirements for distributors with downlines. 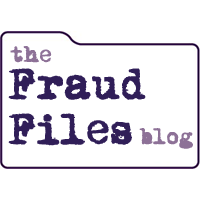 In order to “qualify” to receive your commission check, you have to personally purchase a certain amount of product each month or quarter. It is unlikely that Powell was selling the amount of retail products he was purchasing. If he was retailing all of his products, we should see variances in his monthly purchases. Instead, we see his monthly purchases at exactly the level he needs to move up the pyramid. It can’t be a coincidence. Maybe you’re still not convinced that Herbalife and other MLMs are really just pyramid schemes? Maybe you believe that a pyramid scheme would collapse, and Herbalife’s 30+ years of existence defies that? Remember that pyramid schemes can last a long time, particularly with clever moves by their operators. According to the indictment of Bernie Madoff, his scheme went on for 30 years or more. Maybe Herbalife is an equally clever pyramid scheme? One important thing to remember is that a pyramid scheme like Herbalife doesn’t run itself out of existence. If everyone in the pyramid kept recruiting, there would be exponential growth that would quickly exhaust the population of the world. But that doesn’t happen. The pyramid is limited and most people quit recruiting (usually when they see how impossible it is to make money at multi-level marketing), so there remains a large supply of future recruits. Herbalife admitted as recently as 2005 that it had a 90% turnover rate among its non-leader distributors. The company reported 2.7 million distributors as of December 31, 2011, with 548,000 of those distributors being sales leaders. That means 2,152,000 distributors are not sales leaders, and a 90% turnover rate would mean that 1,936,800 of them need to be replaced each year. Where does Herbalife find 1.9 million new distributors a year? 80% of the company’s “net sales” are generated outside of the United States, so it’s safe to assume that the bulk of the recruiting is going on overseas as well. Even still, Herbalife’s U.S. sales figures are strong. How can that be if it is a pyramid scheme? Aren’t consumers too smart to be sucked into a scam? First, there are over 300 million people in the United States. There are plenty of marks who don’t know the first thing about MLM, pyramid schemes, direct sales, or anything like it. Second, I can tell you that consumers are largely ignorant of the truth behind multi-level marketing. I have been researching and educating consumers on MLM for more than 8 years, most notably on my anti-Mary Kay Cosmetics site Pink Truth. I continue to be astounded by the number of intelligent, otherwise savvy consumers who can be drawn in by MLMs. These scams have perfected “overcoming objections” and convincing people to sign up and part with hundreds or thousands of dollars. And multi-level marketing companies try their best to shut up any dissenters or truth-tellers. While Herbalife as a whole has not collapsed over the last 30 years, individual markets have. And this demonstrates the precarious nature of pyramid schemes. They collapse from within before the company as a whole collapses. Bill Ackman has analyzed a phenomenon called “pop and drop” by Herbalife CEO Michael Johnson. 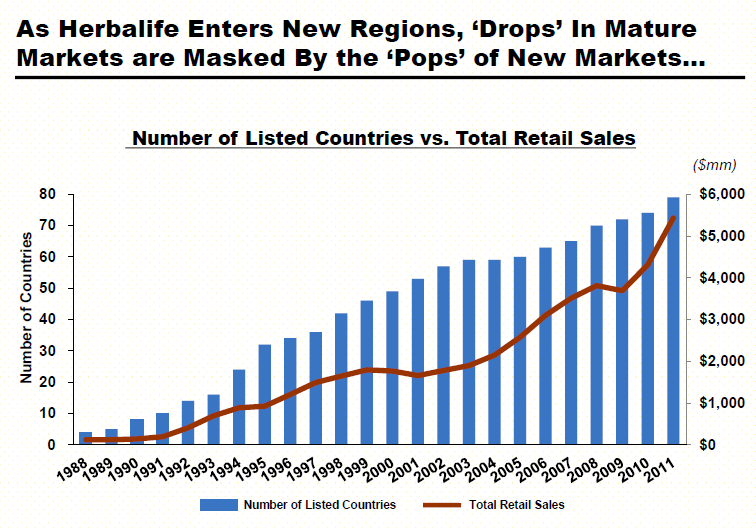 Herbalife masks the drop in sales in “mature” markets by opening new markets that have a big pop in sales. Herbalife reports the new market sales separately for several years, until the sales have dropped off so much that the company stops reporting them separately. If the company runs out of viable new markets, the growth stops. On a micro-level, Herbalife fails over and over. So if your measuring stick of pyramid schemes is whether or not there is collapse, then this company meets the criteria. Distributors fail in astounding numbers of 90% (possibly more) and individual markets around the world routinely collapse. Have a look at Herbalife’s CEO Michael Johnson and his blatant misrepresentations on CNBC. They are mind-boggling. And is this a company you should trust? I’m not exactly sure what this says about our society, but whatever it is, it’s not positive. In the chart you reference, everyone has income. In a similar Herbalife chart, almost everyone would have a LOSS. And I’m not trying to rip on you, Jason. It’s just that what you’ve set forth is a typical argument from MLM lovers… that income in corporate America looks exactly like the pyramid in MLM. 1. The PYRAMID being referred to is not necessarily the SHAPE of the people in the organization, but the concept of a PYRAMID SCHEME. 2. In corporate America, everyone gets paid. In MLM, almost everyone pays in and never profits one red cent. I love this article. I got suckered into many an MLM way back when, when I was much more naive. I finally learned my lesson, but I still see many of my friends and family falling for these schemes. MLMs are indeed masters of overcoming objections. Pingback: Fraud Files Forensic Accounting Blog » Is Herbalife a Scam? As usual Tracy hits the nail on the head. She presents a no nonsense analysis of the truth. Keep up the great work. My question is HOW GOOD ARE THE PRODUCTS???? I worked very crazy hours for a very long time. When I started taking the vitamins I felt much better working 12 hr. days… My co-workers said I talked faster!!!! I never tried to sell the products, I sure didn’t mind taking them!